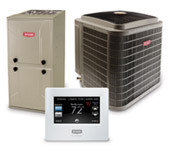 As a certified Bryant and Payne and Trane dealer, Boyle Heating, Cooling, and Plumbing is pleased to offer great financing options for your HVAC or plumbing projects through Financeit. With fast approvals and a variety of great payment terms to suit virtually any budget, the purchase and installation of HVAC equipment doesn’t need to cause anxiety or disrupt your lifestyle. Contact Boyle Heating, Cooling, and Plumbing today for more information on financing for central air conditioning installation or financing options for putting in a new furnace, or certain plumbing-related systems. Work with brands you trust, our team of qualified experts and get interest free or low-interest financing! Another great reason to contact Boyle Heating, Cooling, and Plumbing for your next new installation or rewnewal project. *Certain conditions may apply, terms may change from time to time, please contact us to confirm the current offer and availability.